Hello, friends! I just got back from taking a short break to visit with family. I had the best of intentions to write while I was on vacation, but as you see that just didn’t happen. 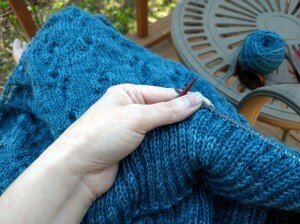 Apparently, I should stop thinking that I’m going to do anything but visit and knit while I’m on vacation in future. At any rate, here’s a snippet of what went on while things were on pause. There were volcanoes. Lots of them. On the way out, the haze only allowed a view of four – Mt Rainier, Mt St Helens, Mt Adams, and Mt Hood. 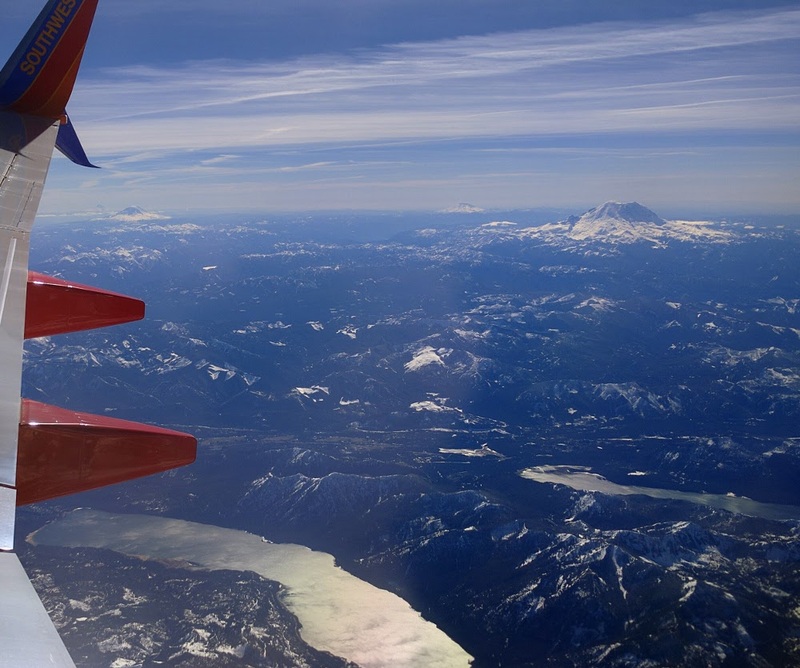 But on the way back in, the weather allowed for a view of six volcanoes peeking up above the low clouds – from Mt Rainier all the way south to Three Sisters. I only have a photo of the view on the way out to show you; I was too busy enjoying the scenery to snap a photo on the way in. (Click the photo to embiggen.) Let me tell you, it never gets old. Then there were the s’mores. 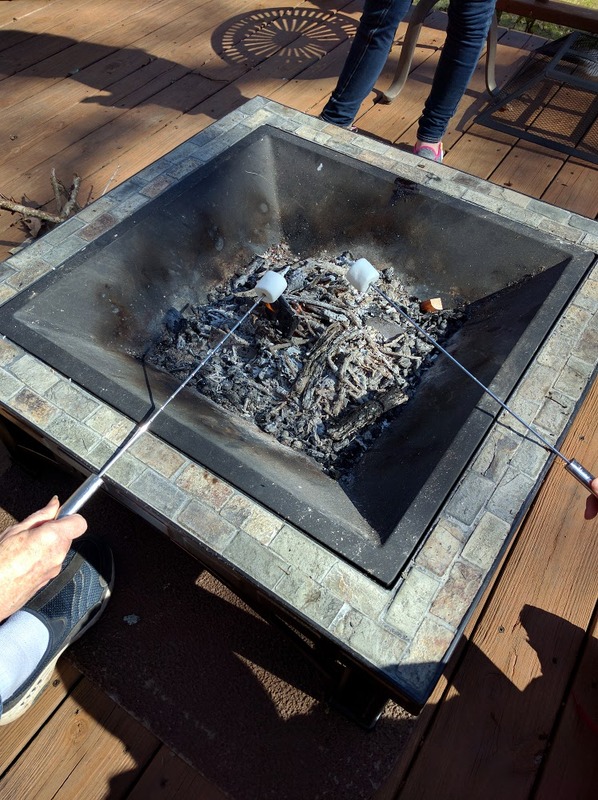 The weather was perfect for building a tiny fire in the fire pit on the back deck to roast our marshmallows. Yum! And of course there was knitting. I took the teal cabled shawl with me as a good item to work on while chatting. I wasn’t liking the shape of the first version, so I ripped it back and cast on again during the flight out. I’m sure the person in the seat next to me thought I was a bit nutty while I unraveled my work. The next day, I was still unhappy with the shape and the spacing on the cabled puddles. So I ripped it back out and started again for the third time. The third time is charmed, right? That third version was much more happy. 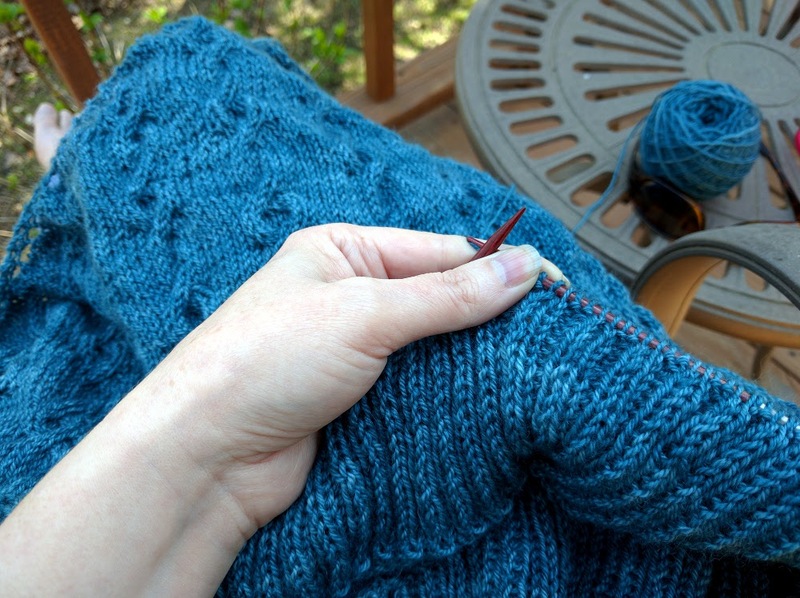 So I continued on, knitting on the back deck, chatting with the family, during the movies… There was a slight pause while i worked a few swatches to figure out the transition to the deep ribbing along the bottom edge. But by Sunday evening I had bound off the last stitch. I cast on for a new shawl experiment when I got home. I’ll show you that later. Meanwhile, I’m thinking that I really need to work on the languishing spinning project. Oh and I have ideas for some new bags for the shop to work on. Lots to do! Back to work. 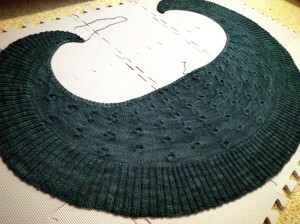 This entry was posted in Knitting and tagged knitting, outdoor, Seattle, shawl, spring, vacation, wool. Bookmark the permalink.